Powers: His sense of eyesight has been improved since becoming a mutant. His hearing, speed, and sense of smell has also increased. (Many characteristics of a wolf). Personality: Weerwolven is a bit fierce, he does have a wolf inside of him you know. He tries to stop himself from tearing criminals to shreds while crime fighting. He wants justice without bloodshed but that seems hard for him to do. He can be bitter but he has a soft spot for the innocent. Especially women for some strange reason. He has a hard time fighting female criminals. That is probably his strongest weakness. 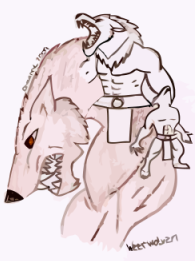 Physical Description: Weerwolven stands at about 7'5 and is remarkably muscular. He looks much like a wolf only he stands on two legs. He is covered with dark brown fur and has razor sharp claws. His teeth are exactly like a wolf's, dangerous and dagger-like. Some people claim that he looks like a werewolf, so that is how he got his name 'Weerwolven'. History: Weerwolven can't remember very many memories of his early years as a child. His memory only goes back to about eight years or so. Xavier Aaron Adkins joined the army when he was twenty years old. He was a great soldier, brave and strong. He was practically fearless which, of course, had its downside. He made a foolish mistake on the battlefield and suffered dearly for it. The doctors would only give him about a month to live so he turned to some otherdoctors who said that they would save him by combining wolf DNA into his DNA. In Xavier's mind it made sense. Wolves were brave and strong just like how he used to be before the accident so what could go wrong? Erm, a lot went wrong. First of all the 'doctors' were insane. They knew that people would do anything to keep living so they decided to test strange experiments on them. Xavier surprisingly survived his test unlike most people. His body was enhanced but the consequences were severe. He saw he had practically became a wolf. The only thing he could recognize about himself was his brownish-gold eyes staring back at him in the mirror.